If we’ve got one radiator which best epitomises the elegance of electric heating, it might just be the Haverland RC Wave. There’s a reason why it’s our bestselling product. Elegant but affordable, lightweight yet sturdy, this stylish electric radiator kicks out heat quickly and efficiently, with its powerful heating capacity kept in check by a high precision thermostat and hour-by-hour digital programming. The model I used for my review was the RC9W 1400w radiator, the second largest in the RC Wave range. This Queen of Radiators is a stately 104.4cm wide by 52.5cm tall. Despite its width, it remains slim at only 7.5cm deep – fitting perfectly in the alcove between our two windows, leaving me plenty of room to tinker. The RC9W comes recommended for rooms with a floor area of up to 16m2, although we found it amply heated our medium sized office, which measured up as 17m2. It was quite a warm day, however, so perhaps we would need another small radiator to supplement if we were heating in winter. Something to try in December! Stylewise, I was impressed by the bright shining white coat of the RC Wave, as well as its sturdy aluminium frame – its elegant design belies the strength of its construction. The radiator is sold with a lifetime guarantee on the body of the radiator, and you can see why the manufacturers have so much confidence in their creation. It made quite a contrast to the central heating radiator on the wall opposite. 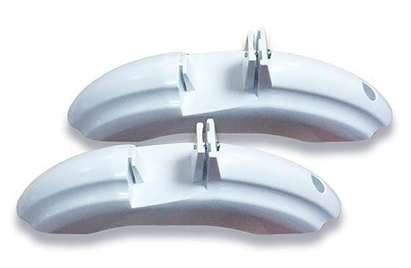 Where the front of the central heating radiator sports uniform ridges, the RC Wave is entirely smooth, save for the small gaps between panels that encourage the air to circulate through the radiator. The RC9W’s distinctive “wave” shape substitutes ubiquitous utilitarian design with fluid elegance, but not at the expense of its heat output: the slight curve of the Wave’s front panels increases its surface area without adding much to its depth, directing the Wave’s radiated heat over a wider area. The RC Wave, like the rest of Haverland’s electric radiators, is suitable for DIY installation: you just fix the brackets to the wall, lift the radiator onto the brackets and plug the radiator into a nearby socket. I have to confess to not having tried this: the management are still reluctant to let me drill holes in our office walls. However, it looks simple enough in the video. Lifting the radiator onto the brackets would ideally be a two-person job, if you’ve got someone to hand: at 15.5kg, I found the radiator pretty heavy. The radiator is also suitable for fitting freestanding if you don’t want to install it permanently. To do this you need to purchase the radiator with a set of feet. The feet simply screw onto the base, allowing you to reposition the radiator according to your needs. 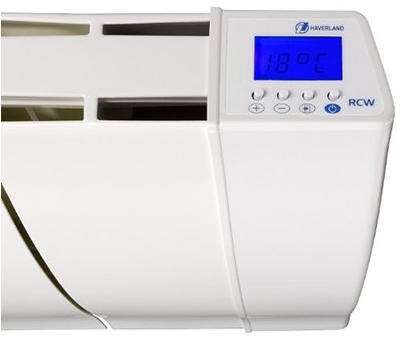 The RC Wave is an exceptionally low maintenance heating appliance: it does not burn fuels so it does not need servicing; it does not contain fluids so it never leaks and does not need bleeding. All you need to do is keep it clean. One downside to choosing a designer heating product is that the shiny white coat shows the dust quite easily. In the same way a white sports car will need to be washed more regularly than a silver hatchback, the RC Wave certainly has more to benefit from a quick rub with a duster than your ordinary common-or-garden radiator. However, this is easy to do – 10 seconds with a dry cloth was all I needed to have our stockroom model looking good as new again. How long does the RC Wave take to heat up? * NB. All RC Wave radiators have an in-built temperature regulator to prevent over-heating, which switches the radiator off if its surface temperature exceeds a set safety limit. Whilst the radiator surface does get hot, it’s on a par with an ordinary central heating radiator. How effective is the RC Wave’s thermostat? Thermostats on electric radiators maintain your set temperatures by switching the radiator off and on as the temperature rise and falls. An accurate thermostat on an efficient radiator should be able keep your room at a comfortable temperature whilst keeping your radiator switched off for about two-thirds of the time. This is great news for your heating bills, because your radiators will only actually use power for a third of the time. But would the RC Wave pass the test? 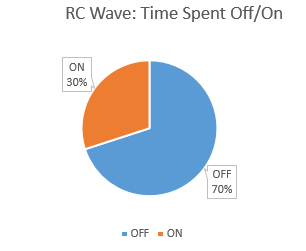 In one hour, the RC Wave only actually used power for a total of 18 minutes. For the rest of the 42 minutes it waited dormant – monitoring the temperature but otherwise using no power. Assuming an average electric cost of 10p per kWh, that comes to only 4.2p to heat the room for an hour. Naturally, in colder weather the radiator might need to spend more time switched on, but, as an indication of the radiator’s efficiency and the accuracy of its thermostat, a 70% switch off rate is very impressive. Time to check the radiator’s next most important energy saving feature – its programming. I don’t know about you, but I’m a bit of a technophobe. I always experience a little thrill of panic when I switch on an appliance and am greeted by an incomprehensible menu – a bit like when someone speaks to me urgently in a foreign language. 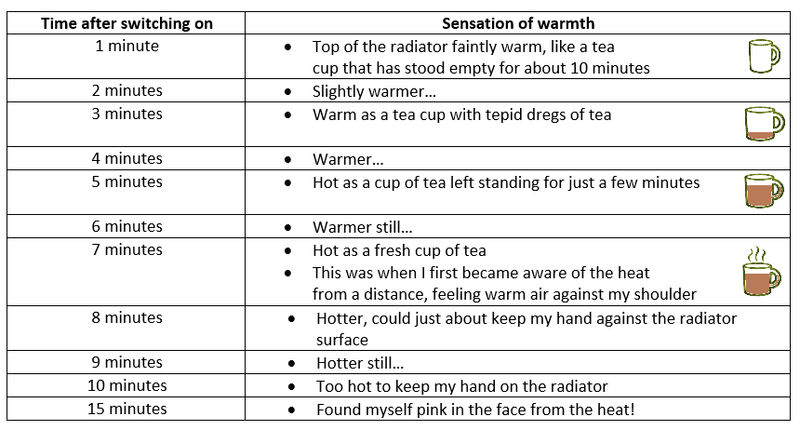 However, this is the third time I’ve reviewed an electric radiator on our website, so my third attempt to programme and use an electric radiator – so I thought I’d have a go at it without reading the manual. Using the radiator was easy: I quickly realised the magic button which seemed to do everything was the “door” button (this is what our customer service team call it – it looks to me just like a square with an arrow in it.) Pressing the door button allowed me to switch between comfort, economy and programming mode; and within each mode it was easy to adjust the temperature by pressing the “+” and “-” buttons. Unfortunately, my resolution to try and programme the radiator without using the manual came to a swift end when I couldn’t work out how to get onto the programming screen. I tried pressing all the buttons in various combinations and then gave up and looked at the manual. It’s far from obvious – you have to make sure the radiator is in standby mode and then hold down the standby button again until the programming screen appears. Once onto the programming screen, it doesn’t get much easier. The RC Wave’s biggest single flaw is that you can’t go backwards when you are programming: if you set the wrong mode to an hour, you have to go all the way back to the beginning of the week. Unintuitively, the +/- buttons do not allow you to scroll back and forth through the hours. This put me off trying to work out how to programme the radiator without the manual, because mistakes became time consuming. Don’t be put off by the fact the manual appears to be in Spanish. It actually contains instructions in four different languages – just flick to page 15 and you’ll find everything you need to know in imperfect but comprehensible English. A few wobbles with the programming aside, I was really impressed by the RC Wave. It lives up to its reputation as an energy efficient radiator with its precision thermostat control and its fast and silent heating. It was clear that with the programming mastered and the thermostat in operation there would be plenty of scope to save money on heating bills – this is a radiator set up to heat when and only when needed. The heat the RC Wave gave off was comfortable and distributed evenly throughout the room – none of us were aware of cold spots or draughts, and the contemporary design was a natural fit in our modern office. 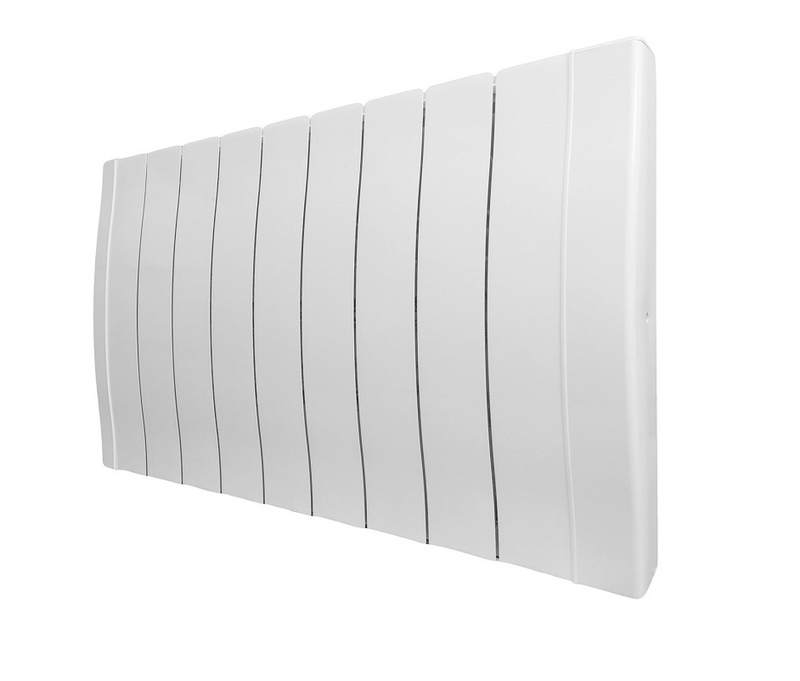 The RC Wave is an excellent all-rounder, and would make a great choice for efficient heating throughout your home. The only caveat to that is that it is not suitable for bathroom heating – so, in this instance, I would swap it for a good electric towel rail. I’ve since learned that the RC Wave is available with an optional remote control. The remote makes programming much more intuitive, giving you the option to move back and forth through your programmes and allowing you to set temperatures for every half-hour. I would definitely recommend purchasing with a remote if you find digital programming difficult. 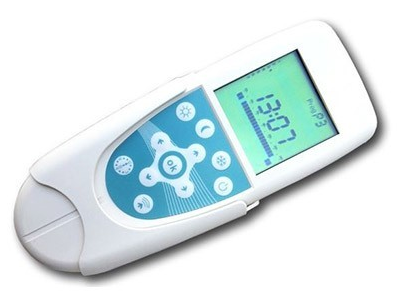 One remote is all you need for a whole houseful of radiators – and you can switch your radiators on and off from the comfort of your favourite chair. Energy efficient heating just got a whole lot easier.